"A little surprise at the end of the book...is like having dessert after vegetables." For the past few weeks, Mrs. Wishy-Washy author Joy Cowley has been answering readers' questions through video interviews. In this week's installment, Joy tells us all about her three newest characters: Miniboy, Mr. Tang, and Computer. To watch the earlier videos, click here! 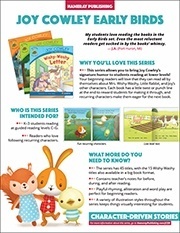 To learn more about the Mrs. Wishy-Washy books, visit our website or click the images below to download information sheets on the Joy Cowley Collection and her lower-level series Joy Cowley Early Bird.